Off the Hook Astronomy: A new hat! Aren't I adorable? 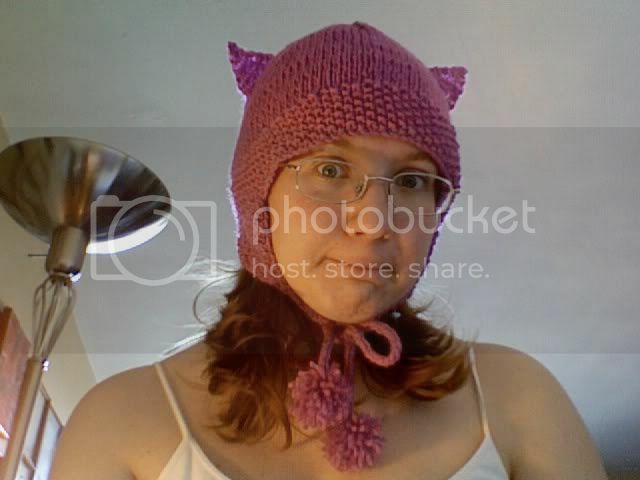 I finally ended up making the Kitty hat instead of the Devil Hat, mostly because a Devil hat in pink seemed inappropriate. That and I kind of wanted to make pom-poms at the end of the I-cords (tie strings). It turned out fairly well, even though I messed up the I-chords a bit and didn't line up the ears perfectly. (My office mate says he can't even tell.) And I managed to use up some of that pink yarn!